Do you know one of the main reasons that content and content marketing is the gateway to success with everything else online? Your Content is Their Solution. 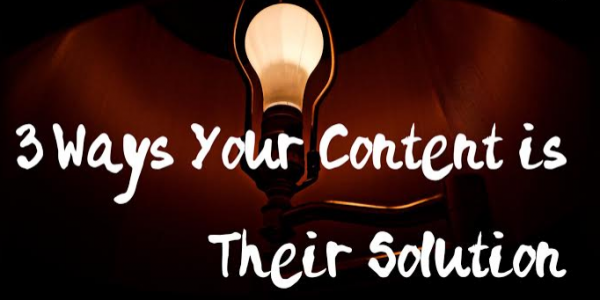 That’s right – the content you create provides the solutions for which your prospect is searching. 1) Your prospects and future customersdon’t get online because the pool is closed. Your prospects are online because they’re searching for solutions to their problems. This basic fact of online success is often forgotten by most online entrepreneurs. When you are familiar with the most common problems of your prospects, it’s easy for you to provide the solutions to their problems. And when you do that your prospects will be eager to do business with you. 2) There more people waiting to hear your unique message, who can only hear it from you, than you can ever get to in your lifetime. It’s true. You bring to the table your own unique message, no matter your niche. 3) Approach & Solution – The unique way in which you approach the problems of your prospect and the unique ways in which you solve the problems of your prospect are what attracts your ideal prospects and customers to you. So when you demonstrate on a regular basis how you approach and solve the problems of your prospects you get to be seen as the “go-to person” in your area of expertise. This is a prescription for profit in your niche. This free template will help you get your content out to your prospects before your head hits the pillow tonight.